For the purposes of this article and this chart analysis, I will be utilizing the Ichimoku Kinko Hyo system. This system is one of the most tested and successful trading systems in the world. More than that, it’s a trend following system that lets the trader or analyst know when to take a trade and, more importantly, when not to take a trade. Equally important is that the Ichimoku system can identify when major trends in a market may change. This makes predicting and forecasting future prices an extremely valuable tool. In general, when price is below the Kumo, the trade direction is viewed as bearish and only short trades should be taken. There are some exceptions to this rule – such as what strategy within the Ichimoku System is being used and which timeframe you are taking a trade on. 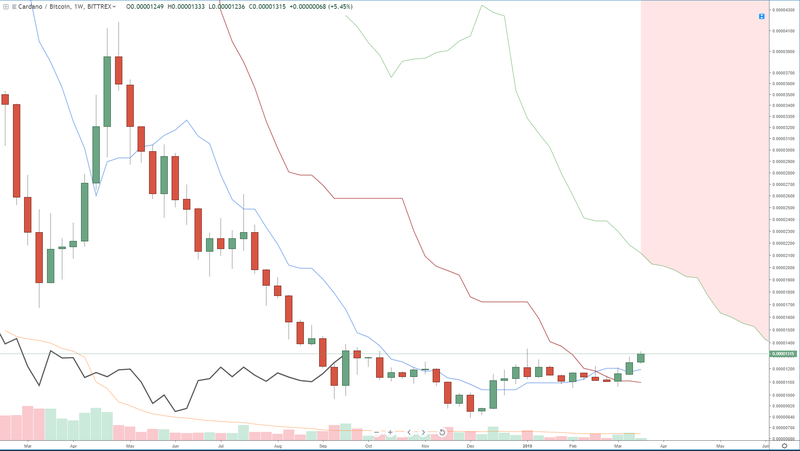 Currently, Cardano (ADA) is trading below the weekly Kumo (Cloud). Cardano is still a very new cryptocurrency – so new, in fact, that Cardano is just now approaching the first display of the Kumo. But there is something more important than that. Cardano crossed above and is trading above the Kijun-Sen. Cardano is currently in the third week of trading above the weekly Kijun Sen and it is the first week where the open and current close are both entirely above both the Kijun-Sen and Tenken-Sen. Additionally, the Chikou Span is very nearly in what Manesh Patel calls ‘open space’. Open space is a condition when the Chikou Span will not intercept any future candlesticks within the next 5 to 10 periods. In order for that condition to be met, Cardano needs to trade above 0.00001388. But that level moves down slightly starting next week – which means the Chikou Span needs to be above 0.00001370. But the most important condition is the fact that Cardano is trading above the weekly Kijun-Sen and the Tenken-Sen is above the Kijun-Sen. On almost any instrument on any chart, when price moves above the Kijun-Sen on a weekly chart, it generally signals a major change in the overall trend. This move Cardano has made is the first time it has ever, in its history, trade above the weekly Kijun-Sen. Predictably, one might ask, ‘is this a good time to buy Cardano?’ I don’t give financial advice, so I can only speak for myself. Yes, I do believe that Cardano is at a great time to buy. Full disclosure, I do own Cardano and it represents the biggest % of my cryptocurrency portfolio. I both hodl and trade it. From a long term holding perspective, I am comfortable adding to my position here. I do expect there to be some pullback and to see some profit-taking. Don’t forget: Cardano is trading up +60% from it’s December 2018 lows of 0.00000830. And that uptrend move has lasted 105 days – very close to the Gann inner year 90-99 day cycle. If there is a pullback, I would expect to see price find support against the weekly Ichimoku Tenken-Sen at 0.00001193. But I don’t anticipate a very deep correction or a ‘false’ move from this level. Considering the volume and the performance of the aggregate cryptocurrency market, there should be higher prices in the present and near future.